Tired of sitting in front of your computer all day? I think we all are. And it turns out all that sitting is very bad for us. It has to stop. Fortunately there’s such a thing as a stand-up desk. Unfortunately, it’s not cheap. Office furniture is expensive, and trendy office furniture is more expensive. Standing desks will always run you more than the sitting variety, and if you want one that lets you change the height back and forth from sitting to standing, you’ll have to shell out big bucks—which is not really an option for most of us. 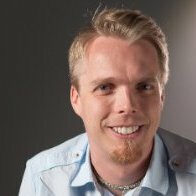 So I came up with a better solution: I made my own. Historically, stand-up desks were quite common. Draftsmen, authors, architects, pretty much everyone used to stand on the job. It’s only more recently that we’ve started spending most of our time at the office on our posteriors. I’m a Lynda.com author, and when I set up my recording booth at my office I decided I wanted a standing desk. It’s healthier than sitting, and standing also allows the body to produce a better sounding voice. It was a no-brainer. But getting that standing desk was not so simple. Now here’s something you need to know about me: I’m what kind people refer to as “frugal” and most people call “cheap.” I don’t like spending a lot of money on something if I think I can make it better myself. And come on, a tall desk should not cost significantly more than a short one. So I decided to create my own standing desk. The cost must be significantly lower than a commercial standing desk. The height must be adjustable for up to 1 vertical foot. It must also be usable as a regular sitting desk. Everything must be modular and transportable. Based on this list, the obvious choice in vendor was IKEA. IKEA products are cheap and modular—and I found all the parts I needed by rifling through their catalogue. At the core of my standing desk setup is a regular desk. 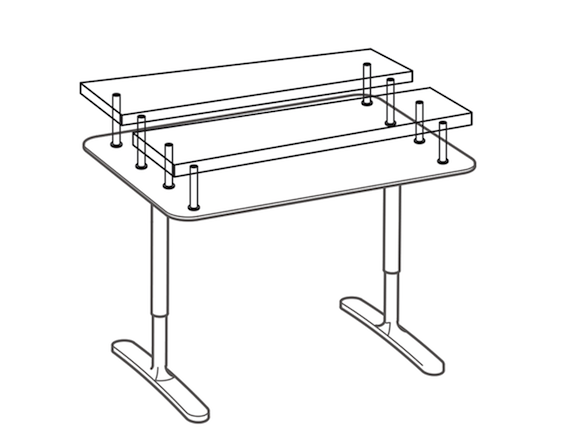 I got a standard GALANT desk with adjustable A-legs (it appears IKEA is trying to phase out this model, so you could get a BEKANT deskwith T-legs of the same size). The metal framework underneath it prevents the desk from flexing when you put a lot of weight on it. 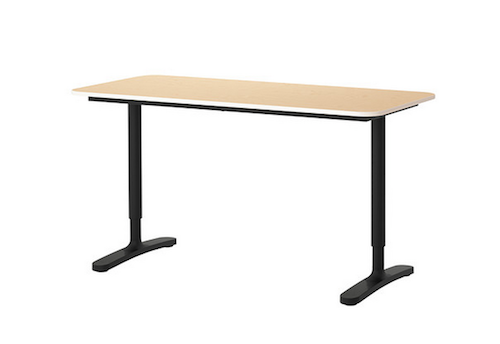 It’s important that the desk has adjustable legs that can get up to about 33 inches. I’m 6’1’’ so mine had to be fairly tall. At full extension, the desk reaches exactly to my inseam, which isn’t tall enough—but that was part of the plan. To get the desk surface up to standing level, I added two independent shelves: One for the monitor and my computer, and one for my keyboard, mouse, and other peripherals. The LACK shelf was the perfect option here: It’s designed to “float” on the wall without brackets and therefore it is strong and light. Unlike most other shelves, which are made of wood or composite, the LACK shelf is made from a honeycomb cardboard material with a composite frame. This makes it strong and prevents it from flexing when you put heavy things like a monitor or your arms on it. Keep in mind that one side will be open (that’s where the wall bracket would normally go), so that side needs to face the back of the desk. Another consideration is that because the core is made of cardboard, you have to be careful when you drill into it. To raise the shelves off the desk, I got two four-packs of CAPITA legs in different heights. I chose these because they’re sturdy and allow about half an inch of adjustment. 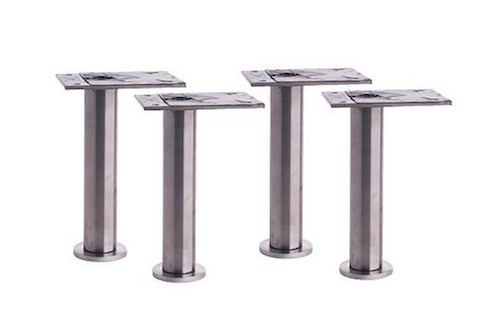 The CAPITA legs also come in several different heights (4 ⅜”, 6 ¼”, 8 ¼”) allowing you to set different heights for each of the shelves. I got shorter legs for the keyboard shelf and longer legs for the monitor, but as you can see from the photo of my final setup, I should have gotten longer legs for the front as well. Screw the legs into the shelves and put them on the desk along with your monitor, keyboard, and mouse. Now comes the interesting part: Adjustments. Getting the combination of keyboard height and monitor height right takes trial and error. When you stand, you want your arm to hang straight down with a 90-degree angle at the elbow. Any lower or higher will feel weird after a while. You also need to have the monitor roughly at eye height so you’re not looking down. If you’re tall like me, you’ll probably have to prop the monitor up further to get it to the right height. Yes, you heard me right: Books. Preferably thick books printed on heavy paper for minimum compression. I find old computer books and academic texts to be excellent. Encyclopedias work well, too. If you don’t have any lying around, I guarantee you’ll find some that fit the bill at a Goodwill store or yard sale. 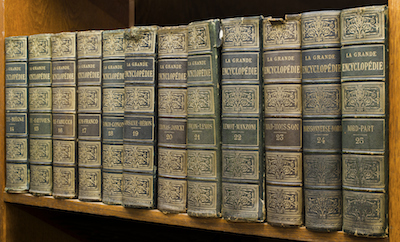 If you want to add some style you can even splurge on a classy old encyclopedia series. I ended up propping up my keyboard shelf with two wooden blocks covered in soundproofing material. First, get an anti-fatigue mat to stand on. This is important because standing all day is hard on the feet. Anti-fatigue mats can be colossally expensive but I found a cheap-ish one at my local hardware store. It’s for gardening work but works just as well in the office. Finally, get yourself a laptop stand. This lets you use your laptop at eye level or use your laptop as a second monitor. The catch here, as everywhere else, is that laptop stands can be very expensive—unless you have some cardboard lying around. In that case, a laptop stand is free! 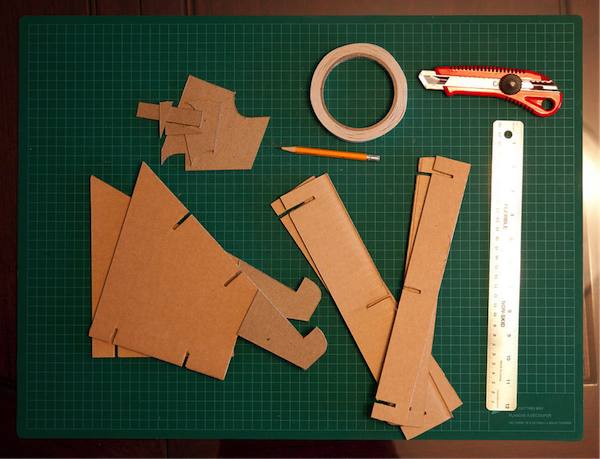 Several years ago I built myself a cardboard laptop stand by modifying the plans for this DIY Cheapskate Laptop Stand. All it requires is a regular-sized corrugated cardboard box (I think I used a box for a DVD player) and some additional thick cardboard for added strength. 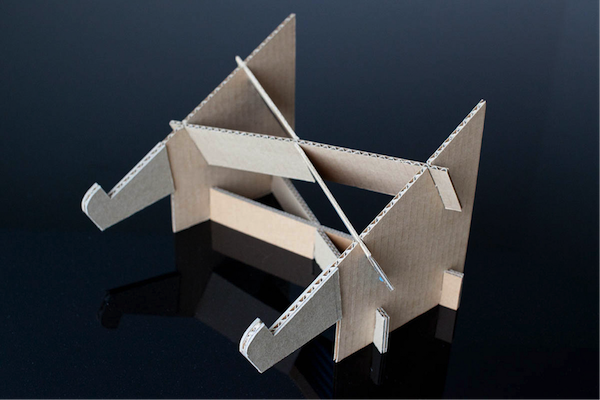 The result is a lightweight but strong laptop stand that can be packed down and rebuilt at any time. Mine was built in 2011 and is still none the worse for wear. As I said, I had some specific requirements for my build. If you don’t have these restrictions, there are many other ways you can build a standing desk yourself. I’m looking at converting my regular office desk to a standing desk, and for that I will likely use gas pipe fittings and bamboo countertop material. If you want to be an electrical engineer, here are the skills you need to master.